Most people do not buy diamonds every day. To help you our Diamond Carat Weight Explained as simple as we can. Although diamond carat weight is an important thing to consider. So too is clarity, colour and cut when purchasing your chosen stone. You will hear jewellers talk about the 4 “C’s” (Don’t get put off, it’s just like any profession they all have their own trade talk). The overall diamond carat weight is most likely to determine a diamond’s value. Fortunately, the size is the easiest characteristic to measure. The term carat is derivative of the word carob. Carob seeds are similar in weight to each other. Your diamond carat weight is divided into 100 points. So a half-carat equals 50 points and is expressed as 0.50ct. For example, a one-and-three-quarter would be 1.75cts. Although it is true that the larger the stone, the higher the price. It is not true that a one-carat diamond is twice the price of a half-carat diamond. 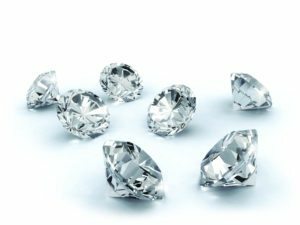 Larger diamonds are found less frequently in nature. A one-carat will actually cost much more than twice the price of a half size stone of the same quality. Cut and mounting can also make a difference in the price. Remember that quality can be more important than size. A one-carat diamond with high colour and clarity values might be more beautiful. A two-carat diamond with lower clarity and colour values, despite a much higher cost. It is important to balance your priorities when shopping for a diamond. Also remember, the smaller your finger, the larger the diamond will appear!